Great news! My huge stone cistern is finally full! 67,000 liters of water. All the other water storage things are full too. So for a couple weeks we have all the water we want. As the rains taper off, then we will have to go back into conservation mode. This year I will have 5 times more water than last year, though I will have more guests too. I still need to build the sauna and more composting toilets. We enjoy lots of dishes with our forest-harvested mushrooms, but pasta with orejas de ratónes is easy to prepare and delicious! 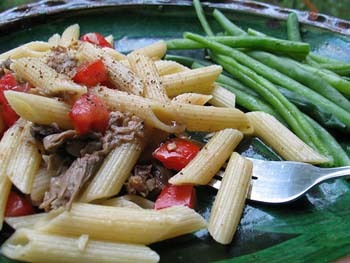 Toss pasta in olive oil and mushroom mixture. Add tomatoes. If available, garnishing with freshly grated parmesan cheese is delicious! You can also garnish with chopped italian parsley or oregano. We serve this with a side of whatever is growing fresh in the gardens! A small, leafy green salad works well. 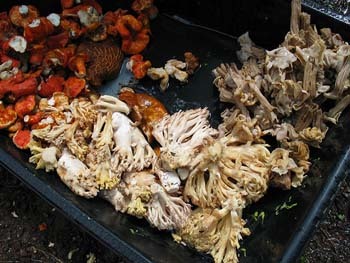 We harvest coral mushrooms, trompas, and orejas de ratón for eating (pictured below). We have had success drying orejas de ratón using heat from the fire at night. These mushrooms are very tasty! We have plans to build a solar dryer for next season so we can enjoy these mushrooms after the rains have stopped. We also have begun a project to help neighboring lot owners in Erongarícuaro inoculate their lands with mushroom micillium. We are protecting all mushroom habitats in order to encourage high growth this year and years to come! Using the book Growing Gourmet & Medicinal Mushrooms by Paul Stamets, we are investigating the ways in which we can grow mushrooms more effectively. 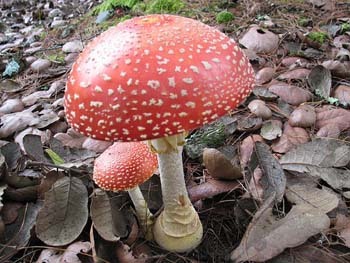 We do not have any psilocybin mushrooms, and would prefer that visitors do not try to use our attractive yet poisonous amanita muscaria (pictured below) for intoxication - it is very bad for your internal organs! You are currently browsing the News and thoughts from the Bosque Village weblog archives for September, 2007. Entries (RSS) and Comments (RSS). 22 queries. 0.129 seconds.